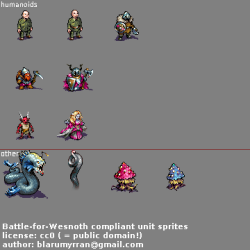 some of my unit sprites for "Battle for Wesnoth" ( wesnoth.org ). 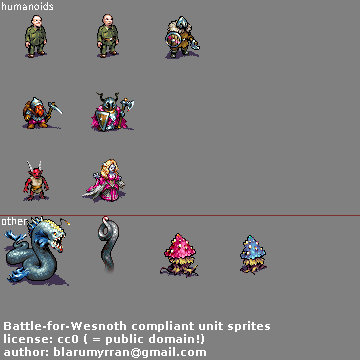 I think I will update it in the future, and dump some more here. Most are not used in mainline Wesnoth, some are not used anywhere (to my knowledge). Licensed by CC0 to public domain. Thanks, FYI I'll most definitely use these in Dusk. Nice, I might use some of them in strange legacy. We want more! Would love to pair this with islands, and boats...vikings! wow they are so amazing!! nice job!